Macrophage in lung. Coloured scanning electron micrograph (SEM) showing a macrophage white blood cell (leucocyte) in lung tissue. The main body of the macrophage is at lower left, with two surface protrusions seen at upper right. This alveolar macrophage is associated with lung alveoli (air sacs) and epithelium (lining tissue). 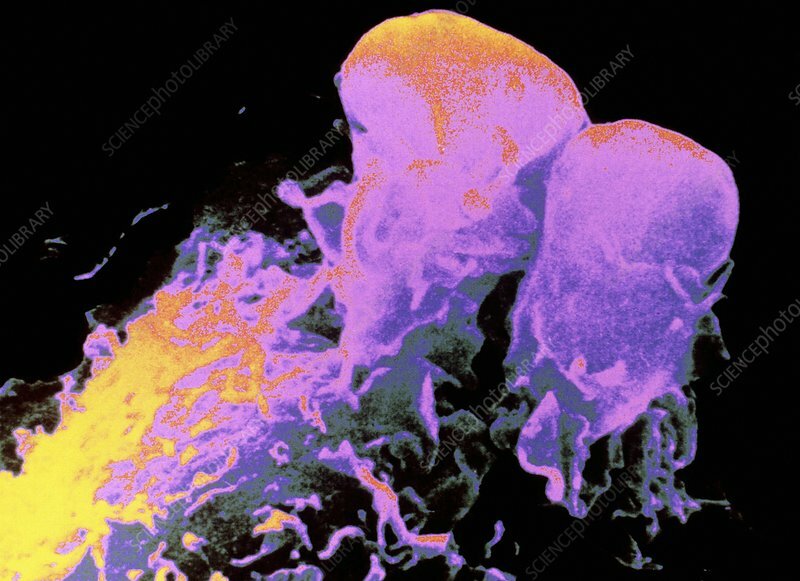 Macrophages are relatively large, scavenger cells that clear the lungs of dust, pollen, bacteria and some components of tobacco smoke through phagocytosis (engulfing). They are, however, vulnerable to toxic pollutants such as asbestos, causing asbestosis. Magnification unknown.